The road beckons to even the most reluctant travelers, inviting them to leave the comforts of home behind and experience all the world has to offer. 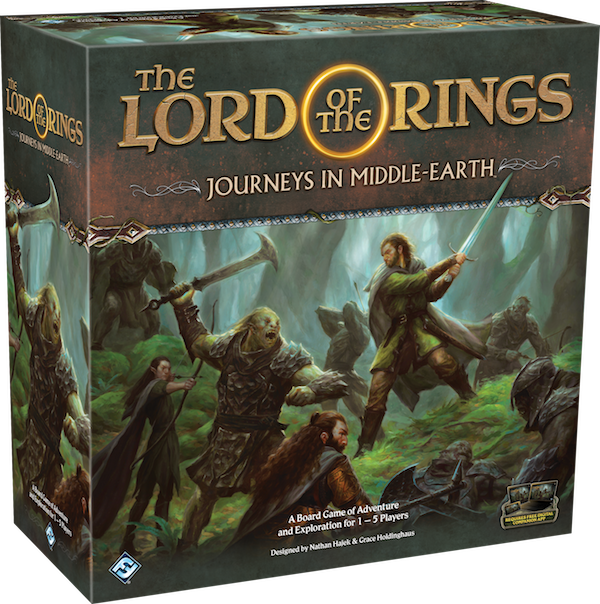 With The Lord of the Rings: Journeys in Middle-earth, you and your friends can embark on your own adventures, experiencing J.R.R. Tolkien’s iconic fantasy world on an unprecedented scale as you make your way through an epic campaign. But even the grandest journeys begin with a single step. Middle-earth is vast, and you’ll come across all sorts of people and places as you stand against the evils that threaten the land. Before your Fellowship sets off seeking adventure, it’s best to know just what you might find in the wilds of Middle-earth. Join us today as we preview exploration in The Lord of the Rings: Journeys in Middle-earth! From the snow-capped peaks of the Misty Mountains to the barren wastes of Mordor, Middle-earth is home to a variety of landscapes, both beautiful and unforgiving. 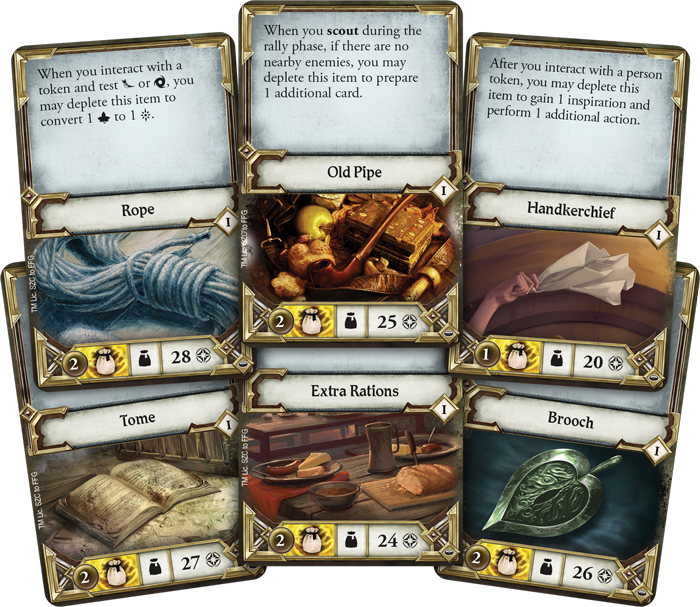 Every time you set out on a new adventure into these lands, the game’s companion app will construct a new map from the game’s 22 double-sided journey map tiles (or the two full-size double-sided battle map tiles), filling this environment with a different mix of areas to be searched, threats to be investigated, and people to meet. And because a portion of every scenario is procedurally generated, you can guarantee that even playing the same scenario again, you'll find new adventures every time. No matter where you find yourself, you’ll need to explore the world to progress in your adventure, discover new items, gain experience, and push back the spreading darkness. This all starts with performing actions. 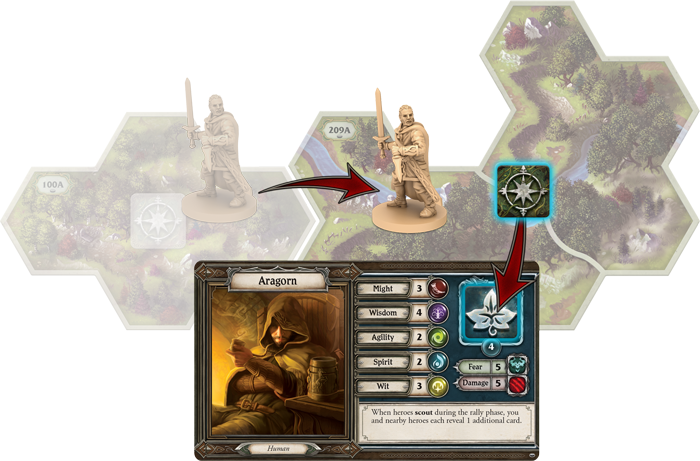 Every hero can perform two actions during their turn, such as moving across the map and interacting with the search, person, and threat tokens that have spread across the map. 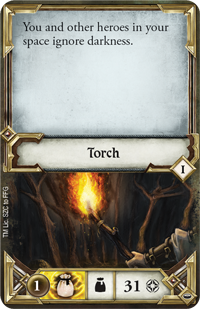 There’s no telling what you might find while exploring Middle-earth, whether it be a band of Ruffians or a wounded man stranded on the side of the road, but interacting with these tokens is likely to lead to a test of your skills. You could, for example, find yourself at the top of an ancient spiral of stairs plunging deep into the earth, which triggers an agility test when you attempt to explore the depths within. In our announcement, we outlined the basics of testing your hero’s five stats. 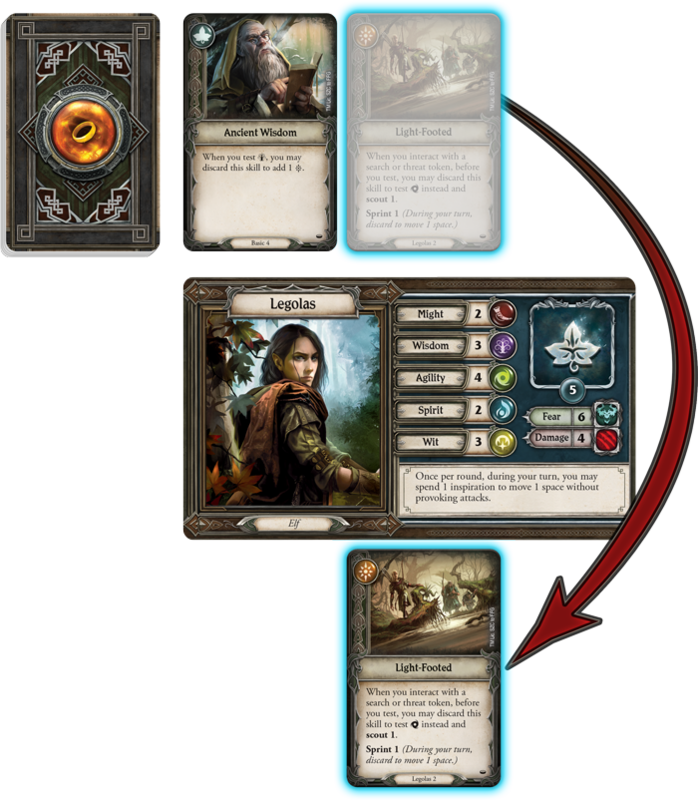 While revealing success icons from your skill deck is the most straightforward way to pass a test, Journeys in Middle-earth gives you plenty of ways to take control over both your skill deck and the tests you perform. It’s always good to be prepared and, at the end of every round, every hero has the chance to rally themselves and plan for the challenges ahead. In addition to shuffling their discard pile into their skill deck, at this point the heroes also scout ahead, revealing the top two cards of their skill deck and choosing one to prepare. When you prepare a skill, you move it below their hero card and abilities become active! If Legolas has his Light-Footed skill prepared, for instance, he can discard it while interacting with a search or threat token to test his high agility in place of another stat, giving him a much better chance of success. 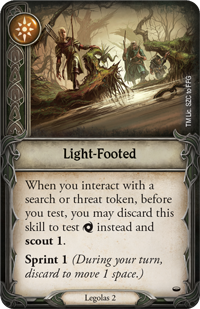 Legolas draws the Ancient Wisdom and Light-Footed skill cards while scouting during the Rally phase. He chooses to prepare Light-Footed, making that card's abilities available to use! Having their skills at the ready is certainly an advantage for any member of your Fellowship, but preparing skills isn't the only benefit of scouting. Any cards you do not prepare return to the top or bottom of your hero's skill deck, and you are free to choose whichever option is best for your hero at that time. 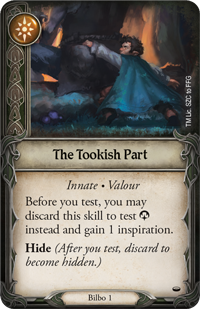 In this way, you can ensure a card with a success icon, like Bilbo's The Tookish Part is the next card you'll reveal in a test! Alternatively, you could bury a less useful card at the bottom of your deck. Beyond your hero’s skills, exploring is its own reward. 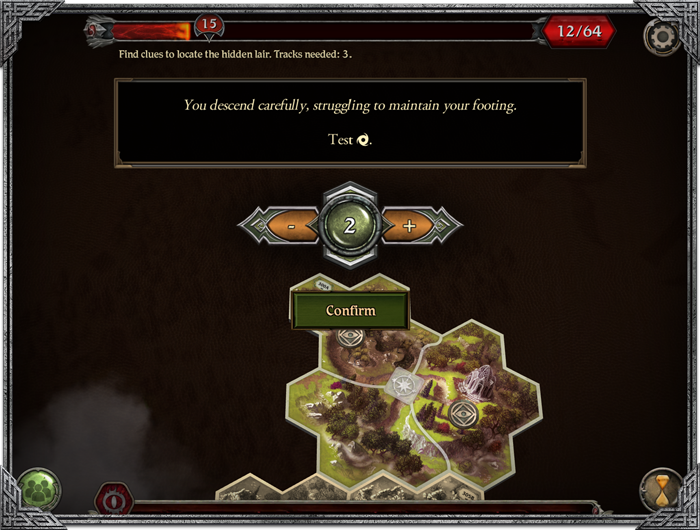 On the game's Standard difficulty, each journey map tile has a square box where an exploration token may be placed when the tile is added to the map. When a hero explores this new tile, they discard this token, converting it into an inspiration token. 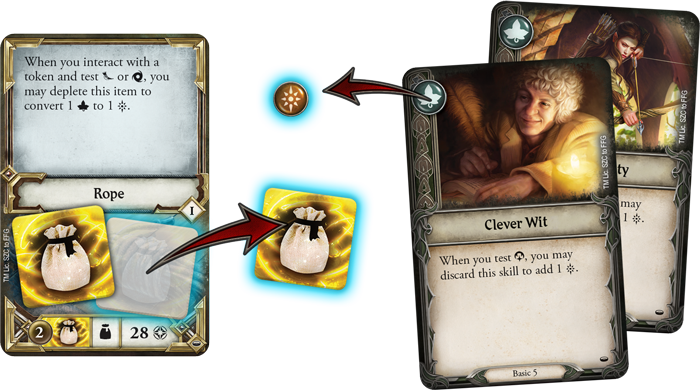 These tokens can then be used during tests to convert fate icons (the silver leaf icon) to success icons. With danger lurking everywhere, you must carefully manipulate your skill deck and choose the best time to spend your inspiration tokens if you hope to survive in the wilds of Middle-earth! 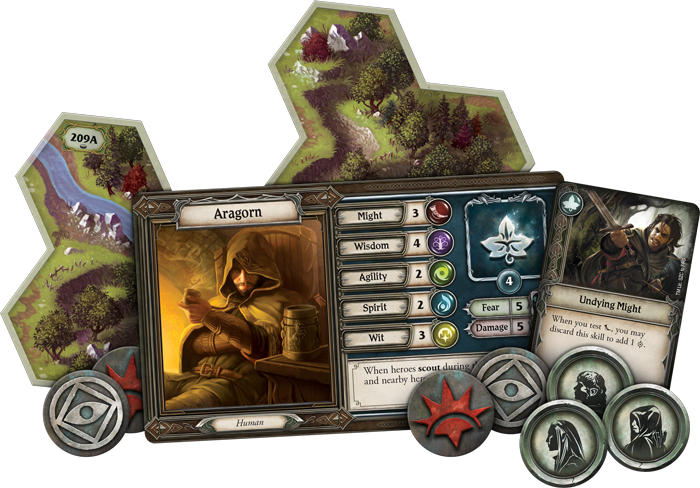 Aragorn explores a new tile, discarding the exploration token and gaining one inspiration! Whether you choose to become a Dúnedain ranger like Aragorn or take up Gimli’s axe, the heroes you play in Journeys in Middle-earth are all experienced adventurers, accustomed to the rigors of travel. But any hero worthy of the title knows their skills will only take them so far. To help them in all their adventures, these heroes make sure to outfit themselves with all types of gear that will be helpful on the road. While items like swords, bows, and mail are useful in the midst of battle, the heroes can also find and equip trinkets to make their travels a bit easier. With a bit of Rope, for example, a hero can convert a fate icon to a success during a test that requires might or agility. But you can only expect to use your Rope and other trinkets for so long. When a hero equips a trinket, they place a number of depletion tokens on that trinket equal to the number in the lower left corner of the card. When a trinket is depleted, one token is removed. and when it has no remaining depletion tokens, it can no longer be used. Gimli draws the Clever Wit and Honed Agility skill cards during an agility test. 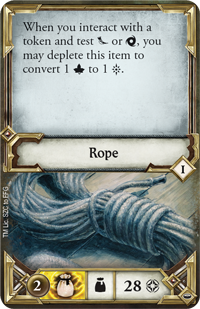 He wants one success, so he spends a depletion token from his Rope to convert a fate icon to a success! Other trinkets enhance your hero’s abilities in other ways. 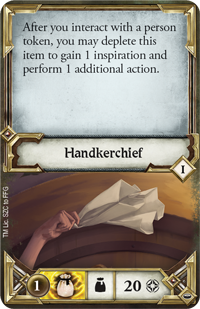 Some, like a Handkerchief, help you interact with the people of Middle-earth, giving you another way to gain inspiration and letting you perform an additional action. Still others, such as a Torch, can be invaluable at warding off the fear that comes when wandering into the deep places of the world. The constant toil of adventuring can be wearisome even to the most hardened heroes. 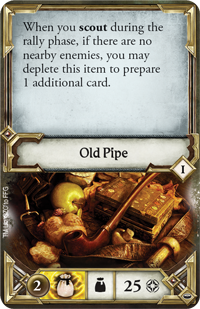 If you take a bit of time to relax and use your Old Pipe at the end of the round, however, you can become even more prepared to face whatever may come your way. You’re bound to learn even more powerful ways to use your trinkets and—just like your armor and weapons—your trinkets can be upgraded throughout your campaign. We’ll examine items in more detail—including upgrading your items—in a future preview! Middle-earth stretches out before you. Though the many roads through it may be fraught with darkness and danger, untold adventure awaits those with the courage to take the first step. Explore everything Middle-earth has to offer with Journeys in Middle-earth! Look for The Lord of the Rings: Journeys in Middle-earth (JME01) at your local retailer in the second quarter of 2019. You can pre-order your own copy of at your local retailer or online through our website today!